I tend to be skeptical a lot. I never expected that any of the “fine dining” within the Disney Complex on the Disney Deluxe Dining plan would be a complete home run. 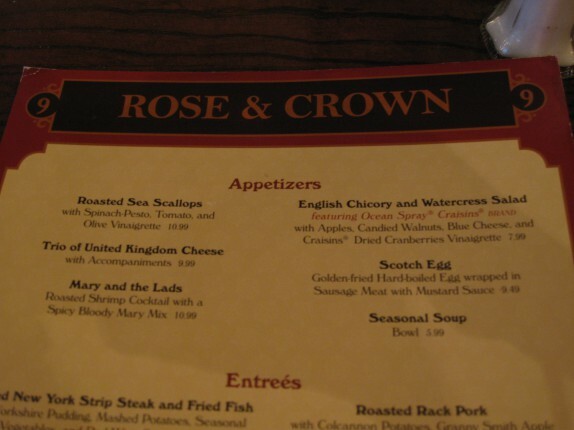 Then we ate at Rose and Crown in the World Showcase in EPCOT. Our day in EPCOT was actually plagued with on-and-off heavy rain. It put a little of a damper on our ability to walk the park and enjoy the day, but we did our best. While thinking about where to eat, we decided not to make a reservation for this one. We were staying in the park until late for the fireworks anyway, so we figured we’d get there a little early and hang out. We actually had a fairly long wait, and we spent a lot of the time in the bar area of the restaurant talking to a fun, nice family from Kansas. Whatever, it’s not like we could walk anywhere else. We were pretty soaked by that point. When we were finally seated, I looked over the menu and found a number of classic British pub-style dishes. I had never eaten a Scotch egg (Golden-fried Hard-boiled Egg wrapped in Sausage Meat with Mustard Sauce). I figured this place would be as good as any to try it. This was a very wondrous and delectable course. 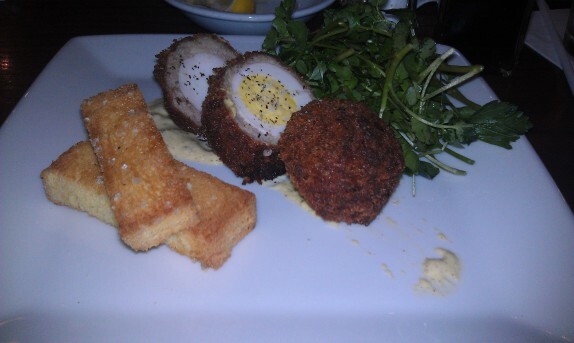 The texture of the egg was perfect, and the sausage coating the egg was juicy and flavorful. It was rolled in panko breadcrumbs, and fried; that led to a crisp exterior. The greens on the side and the mustard sauce were great, and the little pieces of toast, while somewhat unnecessary, were crispy and delicious. Seriously, this was the best thing I’d tasted in Disney yet! For dinner, I had trouble choosing between the cottage pie (Ground Beef, Onions, Carrots, Mushrooms, Creamy Mashed Potatoes, and Irish Cheddar) and the slow-cooked chicken curry (with Vegetables, Basmati Rice, Raita, and Pappadam). I’ve always been intrigued by the very British concept of serving curries at pubs, yet I’ve never had the opportunity to order one. I asked the server to list the vegetables to be served with the curry, and, since cauilflower was one of them, that was a no go. 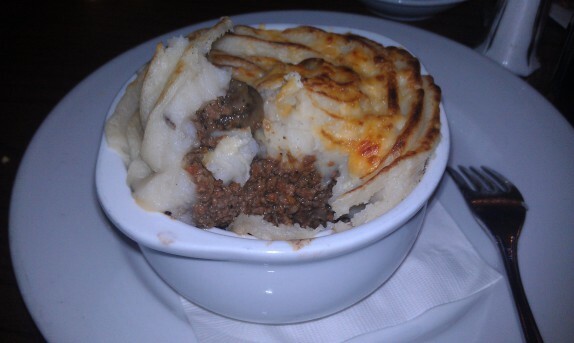 Cottage pie (or Shepherd’s pie when made with lamb) is a fairly easy dish to make alright, but, because it’s the epitome of comfort food, it’s difficult to screw up and even more difficult to make outstanding. 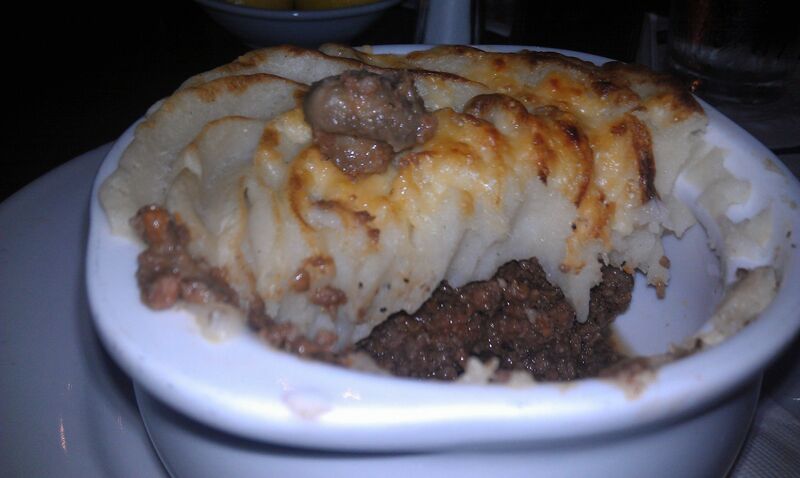 The chef at this restaurant is really special, because this was the best cottage (or shepherd’s) pie I’d ever tasted! The beef was cooked perfectly, and was juicy and nicely seasoned. 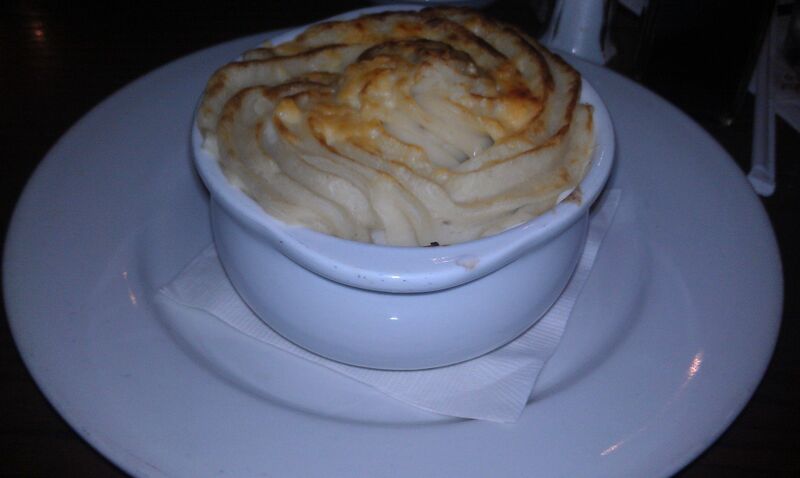 The mashed potatoes were creamy and the taste of the Irish cheddar permeated the potatoes in a perfect manner, demonstrating a focus on quality and restraint. Another difficult thing about this dish is serving it at a balanced temperature, meaning a temperature where the potatoes are warm and the filling isn’t piping hot. 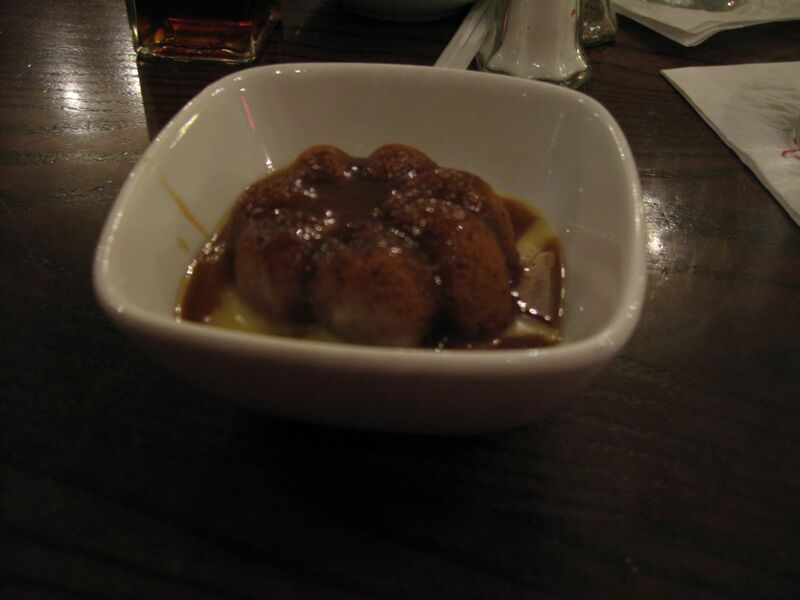 This was served so that everything was at equilibrium, and it was a pleasant temperature to eat from the moment it arrived at the table. I was getting really full halfway into the dish, but I didn’t want it to end. 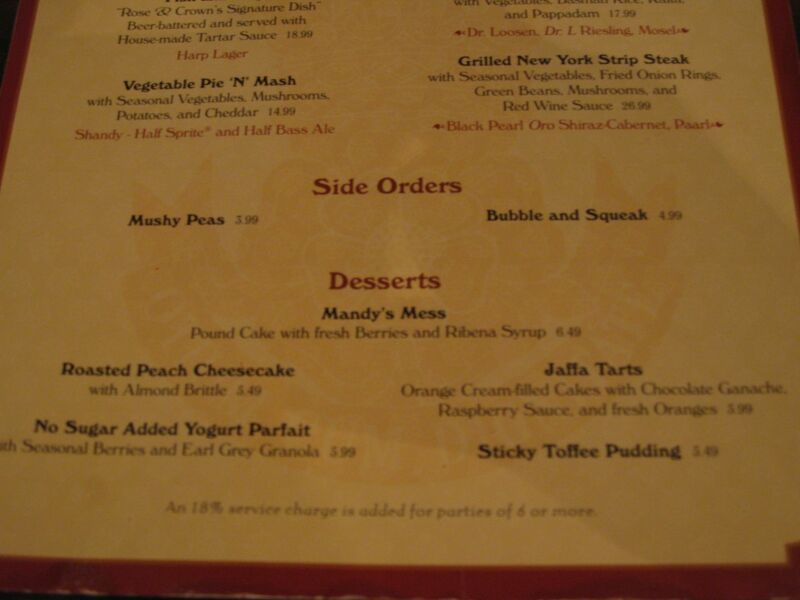 Even without the deluxe dining plan, dessert would have been a no brainer. 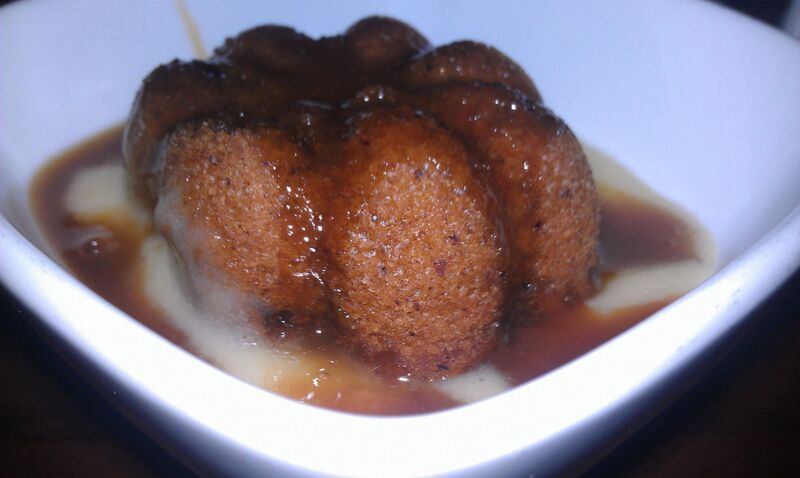 Again, I never tried sticky toffee pudding, so I took the opportunity to do so. 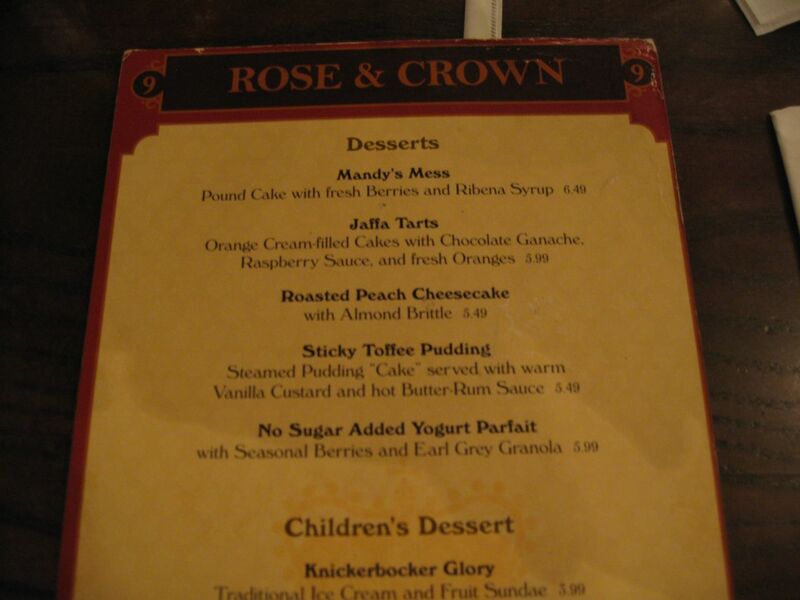 And again, I was floored by the quality of this dessert. The warm cake was soaked in a deeply flavored caramel, and it was all served in a pool of vanilla custard and more of the caramel. It was rich, comforting, and absolutely amazing. Our server was also outstanding. He was a young man that was attentive to our table and was genuinely a pleasure to speak with. 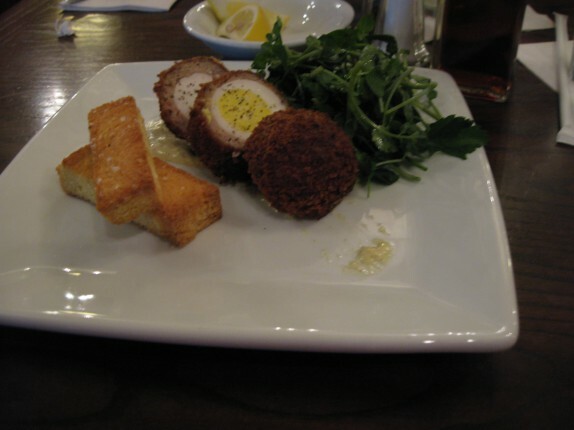 I made sure to provide my inputs on how much I’d loved the dishes, and he seemed to be very pleased, and even offered to speak with the chef to get me the technique for the scotch egg. From start to finish, this meal was an absolute home run. 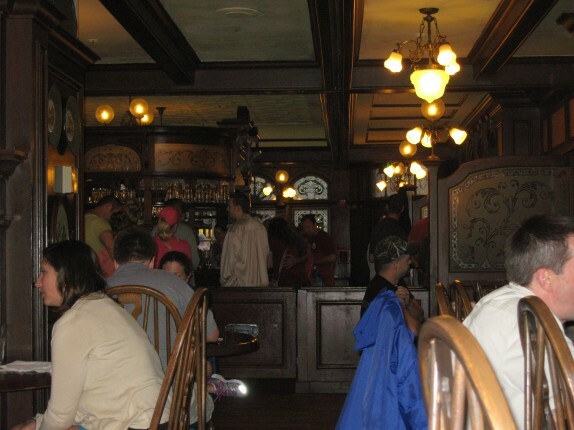 Rose and Crown is going on the short list of places I need to revisit in Disney. We have eaten at Rose and Crown once and had a similar experience. It’s one of the true “hidden” gems. I also think, for as much as I’m pretty much terrified to talk to people in meatspace, something about Disney brings out the Chatty Cathy in me… Talking to people from different places on the globe is on of the more enjoyable things for me. 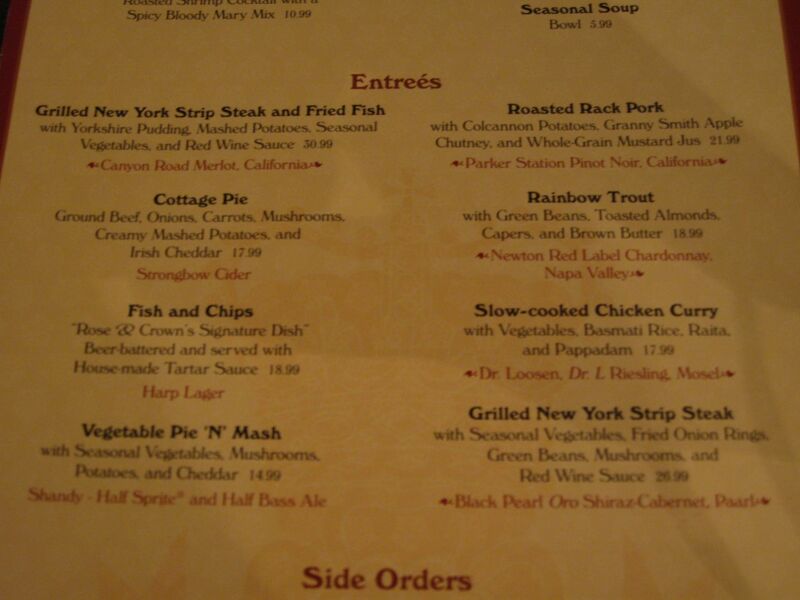 Their menu has certainly lightened up.. I had Yorkshire Pudding and Roast beef. 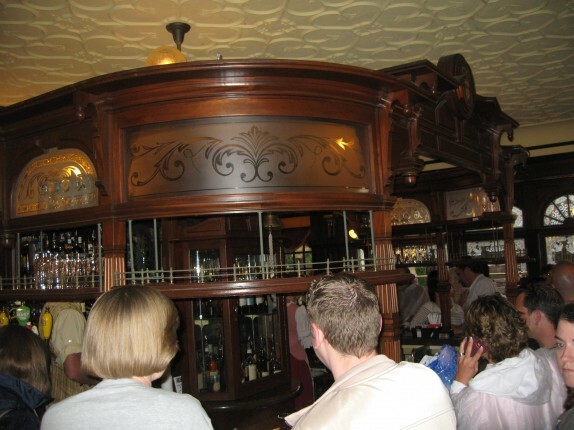 It was a much heavier menu when I was there. Disney is really working hard to bring lighter choices.